$200 or 100% of the first month, whichever is higher, per signup. This applies to all the plans listed on the site (starting at $29/month) as well as when someone contacts them about enterprise pricing. If someone purchases a normal plan on the site you’ll get $200 (or $249 if they pick the business plan), if they contact sales and purchase an enterprise plan you could be looking at a few hundred to $1000+ payout. WP Engine is also a 2-tier affiliate program which is.. amazing. Tiered affiliate programs are really tough to find these days, but WP Engine does it right. What this means is, if you refer another affiliate and they get a sale, the affiliate you referred gets their $200+ commission from WP Engine but you also get $50. Win-Win. As with any other affiliate program there’s a lock-in period where a new signup is required to stay a certain amount of time before the commission is released to you. WP Engine’s lock-in period is pretty industry standard at 62 days (45 if you’re a trusted affiliate), meaning someone has to stick around for basically 3 monthly payments for you to get the commission. Commissions are paid on the 20th of each month after they’ve been released. With ShareASale I use the direct deposit (bank transfer) option as it has zero fees. WP Engine has very active affiliate managers. They clearly care about their affiliates’ success and are there to take care of any questions you might have. I haven’t had the need to contact them yet but based on the email correspondence I’ve received over the years, I know they’re there if I need them. This is getting harder to find in the affiliate space as a lot of companies are just setting up their programs and basically abandoning them. They have the standard affiliate creative available, banners in multiple sizes and styles to fit your site, but what really sets them apart are promos. During holidays and other big shopping events (like Black Friday/Cyber Monday) they’ll send out an email ahead of time giving the details of the campaign. You get early access to banners and coupon codes to promote when the campaign is active. This can turn a normal sales day into a REALLY BIG sales day if you apply these correctly. WP Engine’s affiliate program is nearly perfect. I have only docked one point as their entry price point is higher than a lot of hosts at $29/month. I respect that they want quality customers but this does make it a bit harder to convert a wider variety of traffic, WP Engine’s product and customers are pretty specific. Both a blessing and a curse, but I’ve seen it only as a blessing thanks to the high payouts and quality of service they provide. My client hasn’t churned after 4+ years as a customer! And that’s what we want as affiliates, to create a good fit between our traffic and the programs we promote. If the service is good our traffic will convert and stick around long enough for us to get paid! 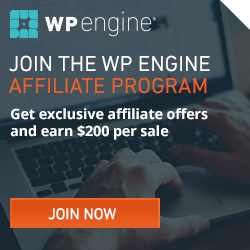 If you’ve got quality traffic that would convert on a $29/month high performance WordPress hosting offer, sign up for the WP Engine Affiliate Program here. You mentioned the 62 day lock-in and then something about the 20th. If I refer someone to WP Engine on like January 1st, would that get paid 62 days later or? Yep $200 commission minimum for every sale, even on the $29/mo plan. So the 62 Day affiliate lock-in period is pretty standard and it’s just the minimum period someone needs to stay a customer before you get paid. You won’t get paid after 62 days, but you’ll be paid on the 20th of the month AFTER your lock date. So if you sent someone to WP Engine on January 1st, 62 days is basically the first week of March – so you’d lock in then. And then you’d get paid on March 20th because ShareASale does payouts on the 20th (at least for the WP Engine affiliate program). Hello , If someone registered a new account for monthly plan (29$) will I get 200$ for this sale ? What about the 200$ if the customer cancel his plan after the first month ? You say I’ll receive after 62 days at 20th of that month … if the customer has cancelled his account will I recieve the 200$ as well ? And any other company would get me the credit if customer cancels his account after one month ? Yes, the commission level for the $29 purchase is $200.. but only if the terms are met. There’s a 62 day approval window which means that person has to stay for 2 months, basically they have to pay for 3 months total. So day 1 – $29, day 30/31 – $29, day 60-62 – $29.. day 80-ish you get paid. Any cancellation before day 62 and you won’t get the commission. I have a full list of affiliate programs here and you can research the payout schedules. I don’t want to share much more than that as it sounds like you’re asking for a host where you can signup to their affiliate program and commit fraud (having people only pay for 1 month, then getting the commission and they cancel = fraud). Even if you’re sending legitimate sales to them but most of your commissions cancel in month 2 or 3 (after payout), you’re likely to get your account canceled. You should be encouraging traffic you send to take the best deal, which is normally on a 1, 2 or 3-year term.